I am looking preferably for a track lighting system to accommodate (4) 250 watt near infrared incandescent bulbs, preferably not too expensive. If not available in a track format, I also may consider non-track. I am looking for a track lighting system to accommodate (4) 250 watt near infrared incandescent bulbs, preferably not too expensive. If not available in a track format, I also may consider non-track. If you might send me some links (or other descriptions), this would be helpful. I am not sure I can obtain a track lighting system that accommodates 250W incandescent bulbs. If not might you make another suggestion. There are plenty of track light heads that will accept a 250w bulb but most are designed for a PAR38 bulb, not the BR40 bulb of most heat lamps. PAR38 and BR40 describe the shape of the bulb, with the BR40 bulb being larger in diameter than a PAR38 so a BR40 bulb may not fit correctly in a head designed for a PAR38 bulb. Heads for a 250w bulb are also going to be more expensive because they have to be built to handle the heat generated by the bigger bulbs. I did find one head that will accept a BR40 bulb, but it's pretty expensive at $80 (at least from one source). I'm sure there are other options, try an Internet search for "250 watt track lighting". I did find one track head at homedepot.com that handles 250 watt bulbs. You can find it here. 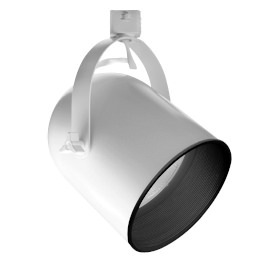 It is compatible with Progress Lighting track systems and uses PAR 38 bulbs.